We came to see the Annual Camel Race sponsored by the Emir of Sakakah. When we arrived at the starting line, we saw almost 600 camels randomly scattered across the desert. Suddenly all the drivers reversed their directions as the word spread that the starting line was back a ways but no line was formed. The gun was fired and the race was underway. Camels were stretched across the desert as far as we could see. I joined the official Aramco photographer, Khalil Abou El-Nasr, in the back of a pickup truck. We raced across the desert ahead of the camels. I shot slides, black and white photos and video. This was not an easy task in the back of a bumpy pickup truck. Eventually, we approached the Bedouin tents erected near the finish line. 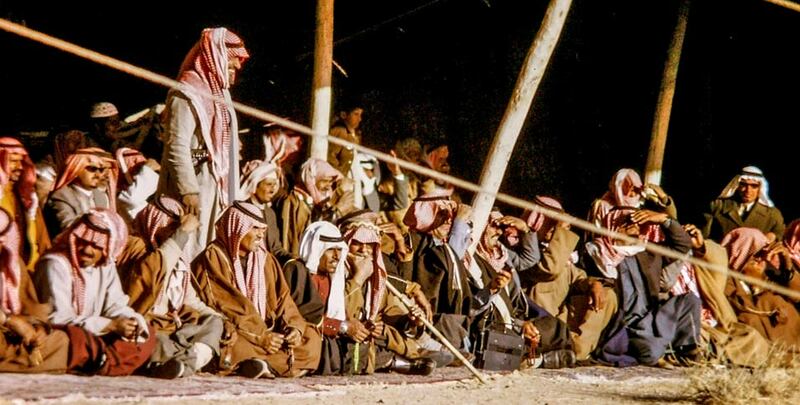 A large crowd was gathered including the Emir. Four beautiful camels were standing nearby – they were prizes for the winners. Others received cash prizes. The Emir Abd ar-Rahman as-Sudayri – ready to disperse cash to the winning camel drivers. The fourth winner was a 15 year old boy.